As we at CC turn our attention to the critical issues that emerge in dance’s current encounter with the museum, this conversation covering Neal Beasley’s career with the Trisha Brown Dance Company as well as his own choreographic interests, offers practical and theoretical insights into the embodied forms of archiving that take place in the work of repertory and contributes to the question of what it means for a visual arts institution to collect a dance. As a member of the Trisha Brown Dance Company, first from 2003 – 2007 and then again since 2010, Neal Beasley has played an integral role in both maintaining Brown’s repertory as well as creating new works. 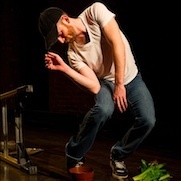 Though Beasley is perhaps best known for his work with Trisha Brown, it was in the context of a LateNight of curated queer choreography at Dance New Amsterdam in 2011 that I first encountered Neal dancing. 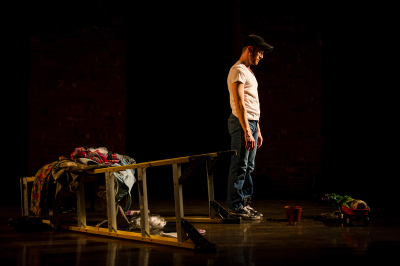 His solo “every adam belonging to me” (since expanded and performed at the Movement Research Festival and as part of the SPLICE series at DNA) explores ties to his personal history of growing up in Mississippi as well as ties to larger ideals of masculinity, desire and embodiment. Yet what stood out was not merely the complex content of his work, but the way it was made to surface through a choreography that was as precise as it was constricted. 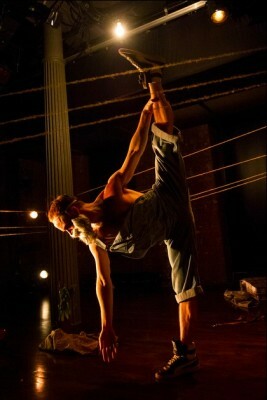 Moving with care inside of a circle of rope laid on the floor, Beasley’s movements dynamically explore a body that, far from self-contained, is known through its connections to the world around it. In this vibrant web articulated through Beasley’s choreography, we might hardly think of his singular performance as a solo. It was from this work, and back through his involvement with the Trisha Brown Company, that Neal and I began a discussion about dance and the archive, and particularly the work of repertory. We seemed to hover around the sense of a past that one both possesses and is possessed by, and to wonder about dance’s relation to this push and pull. Taking this into consideration, the transcript below might be thought of not merely as a record of an interview that took place on May 22nd, 2013 – but rather an ongoing conversation, a series of edits and revisions, in which Neal and I have attempted to figure ourselves between then and now. The ongoing resonances and accumulated reflections, that is, on looking back at oneself and one’s ties to the world. As noted above, Neal Beasley has danced with the Trisha Brown Dance Company from 2003-2007 and then since rejoining the company in 2010. He holds a BFA in dance from NYU/Tisch School of the Arts and has worked was a member of Ballet Preljocaj in Aix-en-Provence, France; with the John Jasperse Company on the production “Truth, Revised Histories, Wishful Thinking, and Flat Out Lies”; as well as with choreographers Beth Gill, Eleanor Bauer, Jeremy Wade, Larry Keigwin, Julie Bour, and Johannes Wieland, as well as choreographer Hinton Battle for the film The Great Observer. Joshua: Is it literally nine to five? Neal: Eleven to five, so a six hour day, but yes. It’s a lot of combing through the pieces that we all already know, often going back to video. And so much of the work is improvisation when it’s being created, that it really feels like we’re on the hunt for the magic of the first time – that thing that caught everyone’s eye. In terms of a compositional process, it can be really frustrating to try and maintain spontaneity inside of something really rigorously defined and repeatable. It’s a very particular quandary to repertory. Joshua: Do you think that quandary is specific to Trisha’s work at all? Neal: Yes and no. I think the way we approach it is specific. A lot of repertory companies do that work because it is about revival and maintenance of a body of work, but we have a certain deference to video or to the physical archive of someone’s body to keep certain things alive. It’s always something that I’ve felt particularly challenged by, and I think a lot of us do in the company — the tension between embodiment and our own presence, having this body, this mind, these skills, and keeping that alive inside of a choice that was made by a very different body at a very different time. It’s a tango back and forth between trying to hold on to that and trying to let that go. Joshua: When you say “the physical archive of someone’s body” it makes me wonder about how bodies communicating across time. And not only person to person, but within a single dancer’s body how the history of the work might be recorded and communicated perhaps in ways that exceed something like a video recording, for instance. Neal: Exactly. The company itself took on this huge archival initiative four years ago that has been trying to put together all of the ephemera of Trisha’s repertory, all the sets, costumes, and thousands upon thousands of videos of every step of the process. And yet, what someone pointed out recently is that we rely just as heavily on physical embodied memory, either from the people who were around for the creation of something or who danced it. It’s an interesting question, between what the body remembers and what the eye sees, what do you defer to? Neal: …We love to go backwards. Joshua: Yes, and are we going backwards in order to resuscitate a particular moment? When you return to the Trisha’s explorations with gravity or, more broadly, to Judson’s collision between dance and everyday life, do you return to awaken the similar revolution in dance or to reawaken the movement? Neal: The baseline of your question about archives, revivals and repertories seems to be “why?” And it’s really great to hear it articulated in this way. Because it’s not like, “Oh we should revive it because it is historical, therefore important.” That may be true, I don’t mean to undermine that. But really, why does something continue to live? And in what context and for what purpose? It’s really interesting to me especially when you start to consider there are multiple worlds that are contending with the identity of being “the dance world” so I think you also have to consider which audience and which world. Joshua: I do think it’s a “why” question, but not in any way that it can be answered definitively. I can ask you “why” but I can also ask “what do you want from the dance”? What about dance as a medium or practice draws you in? I know that’s very broad. Neal: It is broad, but I like thinking about that, and I think that my answer to it is necessarily complicated and multi-layered. I wear the identity of dancer in a way that not everyone does, which is primarily as a mover. I did not enter this field via an interest in it theoretically, or artistically. I came to it through indulgence, through having fun, from a personal and ancient place. That’s why dance. As I’ve grown in the field I think a better question for me now is “why still dance?” There is something that the moving body communicates in a way that nothing else does. There is something immediate and energetic about it to me, and in that way, though I don’t like this word, something mystical. I think of all the times I’ve sat in an audience and for no apparent reason inhaled really sharply because of something that happened. Or I often watch dance kind of dancing in my seat along with the performer. I was talking about this with a friend, and he was talking about what happens in a person sitting in a chair on a cellular level, the way as an audience member every part of you is involved in what’s happening on stage. So there is that too. In French they differentiate very strongly between performance and dance, or at least I heard that distinction for the first time in a way I’ve never heard it in English. It’s funny, so when we talk about performance it’s not necessarily always, “dance.” I’m rambling. Joshua: No you aren’t, it’s really great. Neal: I’ve always said, and I don’t know if this is inherently true, that most people don’t have a reference for the body doing what dancers do with it. The way that we have other references for visual culture or the way we understand written or spoken language. Most people’s reference to their body is in a pedestrian context, maybe we run, maybe we lift things, maybe we dance in nightclubs, make sounds and roll on the floor. But whatever it is about watching dance, it’s jarring. People can’t always enter it in the same way and I think that’s part of it’s power. I don’t mean to say that it’s exclusive, but that it does something else. Something you just said also made me think of how I feel like it’s very easy for me today as a person to feel estranged from my body in everything except for what I do for a living. In every other realm my experience of the world feels so heavily mediated. But there’s something about dancing for me that feels like being in real time. And I don’t know if there is maybe something about that that people are craving, but I know that I crave it. I guess in answer to your question: why dance? I still have that craving, I still have this belief in the form, not that it’s pure, that it hits me, whether watching or doing it, on a level that resists being kind of made into a system of signs and signifiers in the same way that so many other things do. People certainly use it that way, have different concerns, don’t get me wrong. But I’ve always been drawn to things I’m actually not understanding. I don’t always understand how to articulate that. But that’s enough justification for why for me. I guess, interestingly there is this thing of how we define work. How do we create value around the working process? Neal: A specialist, a master. Joshua: Yes. And one that produces furiously. I never feel like I’m producing enough. But when I’m working on a dance, and particularly in rehearsals, there is this way in which in the dance happens, and the work is actually about moving backwards, against that furious flow, to try and find ways the dance can be repeated. You catch the possibility of something, and then collectively you kind of strive for that possibility again. It feels so different to me from any of the other modes of work. In this interview even, I don’t really know where we’ll end up, but I know when we’re done I’ll go over the recording, I’ll translate it into text, through language I’ll creature figures of you and me out of this conversation, and hopefully it will make sense to the reader. Sense seems to mean something different when you’re making or remaking a dance. Neal: That’s really beautiful and it makes me think about this last work that I made “every adam belonging to me” a solo based on my own kind of autobiographical mythology and in relation to masculinity. As I continued to work on that and develop it into this half evening thing, I became fascinated with this question of failure. So at a certain point in my own process, I said to myself out loud, in the studio, by myself, “Neal, what would it really look like for you to fail?” What would that be? To genuinely try and assume failure from the outside, beginning from a place of it not working. You discover by way of what’s left. There is a freedom in dance for that reason. It has a freedom to constantly bend and break it’s own rules in a way that I feel is very seductive. With failure, I’m not achieving that thing I’m setting out for, but I’m dealing with the reality of what’s happening. Joshua: And what has happened with “every adam belonging to me”? Neal: I mean it was interesting, me trying out that path of maker because it’s ironic for someone who, as I said, identifies first and foremost as a mover. My own work has turned out to be incredibly static. Part of that too is that the first iteration I had just freshly injured by back so there was a lot that I just couldn’t do. I was like, “Oh, I can’t really move”. I think partly that raised the question: Neal, what is it for you to fail? But part of my answer was to not rely on the seductive tactics of a more articulate body. Because I know how to do that, I’ve had a career with that, I’ve trained at that. So then, for me to turn that off, what’s left? What is Neal as a thinker and a person living inside of this form? Joshua: And what was left? How did you deal with limited mobility and shifting from being a mover into a maker as you put it? Neal: I am finding that particularly as I make things, I’m having to sift through a lot of the limitations both in myself and in what I’ve come to understand about the form thus far, if that makes sense. The process of making this last thing was filled with stops and starts and trying and trying and trying and ultimately throwing out this list of everything that I’ve tried. Often the choices that I had made felt, and I don’t mean this to sound trite, but arbitrary. I made choices so that I could dig around inside of the choice and see what it had to offer. And I was very conscious of my reliance on tactics other than choreography in this last piece. The power of listening to language, and how recorded text frames the movement, and use of other accouterment; props and outfits and beards and hats and all other stuff that sort of helped me. But what worked about all these things, and not to pat myself on the back, but what I’m satisfied with is the way even with all this stuff the piece was still very raw in the end. Almost like some existential sadness. (Neal laughs). Joshua: Well let’s follow that, how would you describe the sadness? Neal: Well there’s something sad about working in this ephemeral form in general, cause I do miss it when it’s over. 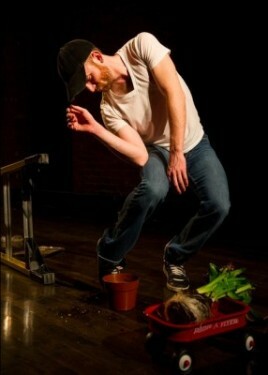 But with this solo in particular I felt like I was using dance to investigate old ideas about myself. And the sadness was this really weird experience of what perhaps are things I always felt and believed about myself and kind of understanding how to unpack them. Is this true? Is this serving me? And do I care at all? I was aware, as I was performing this piece for whatever reason, that I didn’t feel like myself. I felt like I was just as much outside watching myself do this thing as everyone else in the room. Joshua: Is that different from the feeling you have when you’re performing in other people’s work? Neal: Yeah, it is actually. It felt quite different. When I’m in other people’s work I’m acutely aware of being in my own body and wondering if I am doing well in their work. Joshua: So does this mean you see yourself eventually shifting from being a mover to being a maker in your own right? Joshua: We keep coming back (or maybe I keep harping on) that tension between bodies in a dance, but I do think it’s a really profound thing: to feel the demands of a work and to be able to still move. Neal: It’s true, and it’s interesting to think about that because given that I’m coming from rehearsal today, where I feel like a large part of our day is spent talking about one layer of what it is that we are doing, which is the very nuts and bolts of repertory: you are supposed to be here doing this shape in relationship to this body. Coming from a musical family, it makes me think of harmonics, where once there is an ability to play all the notes correctly, then there is this very different ability to phrase them in a way. I wonder if there is something similar that is happening inside of successful dance. It’s like when a series of letters are strung together in a way that creates a meaningful word, it is very different from a series of letters that don’t really mean anything. They suddenly have an aliveness to them. This is where I love and hate what I do. When you search to grab on to what works about dance, it becomes really like, “Why does that work and why does that not work?” I suppose that just gets us back to the beginning with the question of repertory and how you keep a work alive? Joshua: Before coming to meet you, I watched the video of Trisha doing Accumulation with Talking plus Water Motor. It’s as powerful now as when I first saw it. I discover new things each time I watch it. And I always wonder whether that kind of vitality is something that originates with the piece or whether it accumulates in my watching and rewatching, in Trisha’s repeating and repeating the same movement. Maybe there’s something in the work that keeps itself alive – or at least something worth taking seriously in that notion that helps us get away from some of the more desperate feelings we have about keeping and saving, archiving and cataloguing performance. If something still vital remains, no matter what, the whole notion of archiving cracks open a little. Neal: I agree, when I see that video I get it. It’s this freedom to make and break one’s own rules. The way that I think Trisha was obsessed with structure and rules and systems. I think what I love about watching her do that solo is that you so see her. You see her wit, you see the way her attention flies to different tasks and when she adheres to the task and when she doesn’t; when she turns the volume back down and when she lets it get complicated. It’s funny, you know, Jamie Scott who dances for us now, danced in the Cunningham company throughout the final tour. She told me that Merce would be the first person to tell you, “No you do it this way, I know they used to do it that way, but no you do it this way, because this looks right on you,” I was so touched by that. Like, there is a deference to the body that is in front of him because that is what’s happening now. It can feel so oppressive, repertory, deferring to bodies I will never meet. But then again, reacting against that is part of the thrill. Joshua Lubin-Levy is performer writer and scholar. He has worked with a wide array of artists including Richard Move, Jack Ferver, Vaginal Davis, Young Jean Lee, Karole Armitage and Robert Wilson. He is currently developing a new project with Kaneza Schaal (of the Wooster Group and ERS) and artist Christopher Myers. He is also a PhD candidate in the Performance Studies Department at New York University – with a special focus on Jack Smith.